At yesterday evening's Music Tank event in London someone who'd just received an advance copy of my book mentioned that they'd seen the heading "Jennings' Law" in the table of contents, and asked me to explain. Initially I was a little shy about this law (it was the publisher's decision to give it it's own subheading and include it in the ToC); but that's appropriate because the lesson of Jennings' Law is one of humility. The law states simply "people make most of their discoveries elsewhere." In other words, no one is ever going to build a system, a service or a platform that has a monopoly, or anything close to monopoly, as a source of discoveries. Not Apple, not News Corporation, not Googlezon. In some ways you could say that the Net itself is as close as we're going to come to the ultimate discovery platform, but even the Net will never dominate our paths of discovery completely — see yesterday's post about discovery by simply walking the streets. There are two reasons why perhaps I was a little shy about this law to begin with. First, it's fairly directly adapted from Jakob Nielsen's Law of the Internet User Experience: "Users spend most of their time on other sites." Second, some people (including those with whom I was discussing the issue last night) think that it's fairly obvious that no one can "own" the discovery experience. Obvious it may be to some, but I don't think that stops some of the 'land grab' mentality among some media enterprises, who want to own, and control, as much of the users' attention and experience as possible. You could see the recent divergence in approaches of MySpace (blocking third-party widgets) and Facebook (positively encouraging them) in terms of denial and acceptance, respectively, of Jennings' Law. What other implications does this law have? As with Jakob Nielsen's Law, it encourages humility, openness and a willingness to work with the conventions and standards of others. Here's a simple example of openness. Earlier this evening I went to a gig where Jason McNiff was playing support. I'd never heard of him before. I can find Jason McNiff on Last.fm. Right now there's not a lot of material there: I can see that he's produced a couple of albums, but I can't hear anything since the artist, his label or their distributors have not yet loaded their music onto Last.fm. The Jason McNiff page on Foxytunes promises more. Some of the links turn out to be dead ends right now — the two Hype Machine links to music on blogs have expired, and there's no "Jason McNiff artist radio" on Pandora — but there are YouTube videos and Flickr photos to check out (blimey, I hadn't noticed those spectacular cheekbones from 30 metres back). So we're starting to get somewhere and be able to follow some leads. This is what I call foraging in the book. Now look at Musicovery. It's prettier than the other sites. Spectacular and attractive, even. It does provide a means for discovering new music if genre, mood and period are your main criteria. In terms of helping me find out more about Jason McNiff, though, it's not a lot of use. There's nothing wrong with Musicovery. Anything that adds to the means by which people can make discoveries has its value. But Musicovery works against the grain of both Jennings' Law and Jakob Nielsen's Law, which argues that "websites must tone down their individual appearance and distinct design". 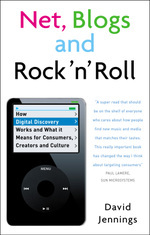 In that respect, something as visually plain and modest as music.of.interest may fit more easily into people's discovery behaviour — as described in Paul Lamere's review.